As a mother of three and sister of four, I’ve seen my share of bloody noses, broken bones, chicken pox, and far too many hematomas (this is one of my kids’ favorite words — I’m always saying, “Ah, that’s just a hematoma!” In fact H. said he might name his first child Hematoma. If it’s a boy.) Or else I tell my kids, “Ah, that bone is just bruised.” And I’m not sure that’s even a thing — a bruised bone. I should’ve asked our very fun and funny trainer, Andrea Arnold of lifesavingenterprises.com what to do about a bruised bone. More than laughs in my CPR and First Aid class today, I received the sage advice not to follow the medical advice from movies. 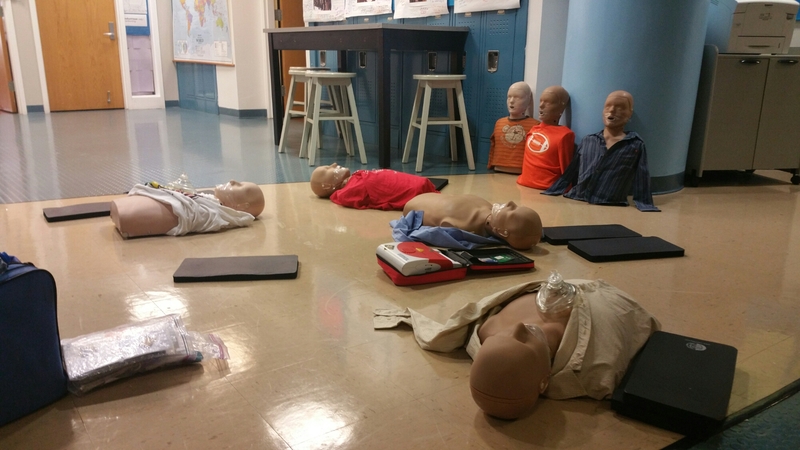 These were our crash test dummies in First Aid CPR class today. Do not be like Mel Gibson in the Lethal Weapon movies and slam your dislocated shoulder back into place by running at a door. See a doctor. You’re lucky if you can pull an antanae out of your belly like Matt Damon did in the Martian. Only remove lodged items in that manner if you are alone and on Mars. Otherwise, call 9-1-1. I’m sure there are more movie myths I overcame today, but I’m weary from learning.